Don’t you just love it when you go to the beach and you get the place all to yourself? You do? Chris Christie appears to agree. The New Jersey governor joined family and friends for day at Island Beach State Park on Sunday. The park was closed to the public this weekend since Christie had to shut down the state government as part of his ongoing budget standoff with the New Jersey Legislature. NJ Advance Media obtained photos of Christie’s gathering, and the governor arrived in Trenton later on to hold a press conference. As he took questions about the shutdown, Christie denied that he got any sun earlier in the day. 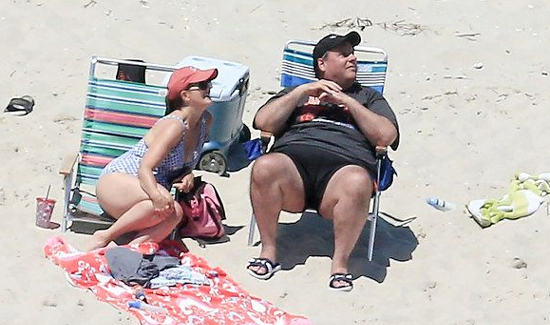 Christie’s spokesperson was asked about the photos after the presser, and he responded that Christie never got any sun because “he had a baseball hat on.” Yesterday, Christie spoke with reporters about how he’s allowed to use the state-owned residence at Island Beach even when its closed.